If You are using this Site or Our services on behalf of an organization or entity ("Organization"), then You are agreeing to this Agreement on behalf of that Organization, and that You represent and warrant that You have the authority to bind the Organization to the terms herein. In that case, "You" and "Your" refers to you personally and the Organization. ECIR is a global, all-volunteer, 501(c)3 organization that is focused on equine metabolic issues and helping caregivers with animals who have been diagnosed with Equine Metabolic Syndrome/Insulin Resistance and/or Equine Cushing's disease. Our Site and services are for informational purposes only and are not a substitute for veterinary care, diagnosis, or treatment. Any health-related information supplied through ECIR services by any persons and any mode of communication is not a substitute for professional medical advice. You should never disregard professional medical advice or delay in seeking such advice because of something you have read on this Site or through an ECIR service. We urge You to consult a licensed veterinarian before making all medical decisions regarding your animal. IF YOU HAVE A MEDICAL EMERGENCY OR NEED IMMEDIATE MEDICAL TREATMENT FOR YOUR EQUINE, WE URGE YOU TO CONSULT AN ANIMAL HOSPITAL OR EMERGENCY VETERINARY FACILITY. Similarly, if You have questions or concerns about a specific medical, supplemental or feed product, or need to report a suspected adverse effect or reaction, please contact the manufacturer or the body that licenses these products in Your country directly for advice. We aim for open, respectful communication on the relevant topics within Our discussion forums. We do not endorse, support, represent, or guarantee the completeness, truthfulness, accuracy, or reliability of any content posted by third parties. ECIR can neither review all material before it is posted nor ensure prompt removal of objectionable material after it has been posted. To the largest extent permitted by applicable law, ECIR does not assume any liability for any action or inaction regarding transmissions, communications, or materials uploaded, posted or otherwise transmitted on Our discussion forums by third parties. Any use or reliance on such content or materials posted is at your own risk. We created Our discussion forums to share information with You and to allow You to communicate with and about Us. ECIR welcomes Your thoughts, views, opinions, and comments on Our posts and photos. Accessing Our discussion forums is at Your own risk. To the largest extent permitted by applicable law, ECIR is not responsible for any losses or other damage You suffer as a result of Your use of our discussion forums. Please be aware that Our discussion forums may be viewed by anyone on the internet. We also use other social media platforms to connect with and facilitate communications related to Equine Cushing's and Equine Metabolic Syndrome/Insulin Resistance. Your posts on those platforms should be related to these topics and in compliance with this Agreement as applicable and the platform's terms of service. You may share posts on social media platforms as allowed by the platform's terms of service. You must be at least 13 years old to have an account on Our discussion forum. You must be at least 18 years old to post a case history, or have a parent or guardian's permission to do so. You are responsible for protecting Your account password and information. You are responsible for removing identifying information from any documents You upload to Our Site. You must be the owner, or a caregiver or representative, with permission to present the equine's health history. You must provide accurate information as required when communicating with Us. You may not use Our Site or services to abuse, harass, defame, or defraud anyone. You may not use Our Site or services to do anything unlawful, misleading, malicious, or discriminatory. You may not use Our Site or services to post advertisements or solicit business. You may not interfere with any other party's use and enjoyment of Our Site or services. You may not upload viruses or other malicious code to Our Site or discussion forums. You may not do anything that is designed to disable, overburden, or interfere with the normal working of Our Site or services. You may not use Our Site or services to violate anyone's intellectual property rights. You may not use, test, or otherwise utilize Our Site or services in any manner for purposes of developing or implementing any method or application that is intended to interfere with the function of Our Site or services. You may not reverse engineer, decompile, disassemble, derive source code, create a derivative work of, or otherwise repurpose any aspect of Our Site or services; attempt to do so, or assist anyone in doing so except permitted by applicable law notwithstanding this limitation. We, in Our sole discretion, may refrain from posting or delete any materials from You that We find inappropriate or in violation of this Agreement, with or without notification to You. We reserve the right to suspend or terminate any User's account for violating this Agreement. You understand and acknowledge that you are responsible for whatever content You submit to Our Site or discussion forums, including its legality and appropriateness. When You create a post on Our Site or discussion forums, You attest that Your post is comprised of Your own work, in the public domain or otherwise without restrictions, or content for which You have obtained all necessary permissions, licenses, and/or approvals. A post is any text, image, and/or video submitted by any user to Our Site or discussion forums. By making a post or comment on Our Site or discussion forums, You grant Us an unlimited, perpetual, worldwide, irrevocable, royalty-free, paid-in-full license to use the content You shared for any purpose without needing any additional permissions from You. We may provide links to other websites on Our Site or discussion forums. Providing a link, however, is not an endorsement. We shall not be responsible for any material on any site to which We provide a link that We did not create. User assumes all risk by following a link. ECIR provides no guarantee that any website it links to will be accurate or available. ECIR retains its intellectual property rights, including but not limited to, copyright rights in all its content published on and through Our Site and discussion forums. You may display, print, or download content on the public area of this Site and Our discussion forums only for Your personal, non-commercial use, provided You do not remove or alter any copyright, trademark, or other proprietary notices. You may not engage in systematic retrieval of content from this Site or Our discussions forums to create or compile, directly or indirectly, a collection, compilation, database, or directory without prior written permission from Us. You may not, without Our written permission, "mirror" any content contained on this Site. 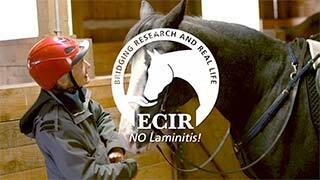 "Equine Cushing's and Insulin Resistance Group," "ECIR Group," "NO Laminitis! Conference" and Our logo are trademarks owned by the Company, and may not be used without Our explicit written permission. Any violation of Our intellectual property rights may result in a copyright, trademark, or other intellectual property right infringement that may subject User to civil and/or criminal penalties and termination of their account. The Company will comply with any properly submitted DMCA takedown and counter takedown notices We receive under the U.S. Copyright Act (17 U.S.C. § 512). If You believe that Your copyrighted work has been copied and used on or via Our Site or services in a way that constitutes copyright infringement, You must contact Our DMCA Agent at the following address: ECIR Group Inc.; Attn: DMCA/Copyright Agent; 2307 South Rural Road, Tempe, AZ 85282, or admin@ecirhorse.org. By using Our Site or services, You agree to defend, indemnify, and hold harmless ECIR, Our affiliates, and their respective directors, officers, employees, and agents from and against all claims and expenses, including attorneys' fees, arising out of or related to any activity by You in connection with Our Site or services. To the extent permitted under applicable laws, User hereby releases ECIR from any and all claims or liability related to any of Our services and any conduct or speech, whether online or offline, of any other User. We reserve the right to change this Agreement at any time as We deem necessary or desirable. These changes will most likely be enacted to comply in changes to Our services and/or changes in the law. We may notify Users of changes by posting notice of the change on Our Site and discussion forums. Changes to this Agreement may occur, however, without notice. Any changes will be effective upon the changes being made to this Agreement. Your continued use of Our Site or services shall be Your acceptance of any changes to this Agreement. All additional terms are hereby incorporated into this Agreement by this reference. The date at the top of the TOU informs You of the date of the most recent change. USER EXPRESSLY AGREES THAT USE OF OUR SITE AND SERVICES ARE AT USER'S SOLE RISK. NEITHER ECIR, ITS AFFILIATES, NOR ANY OF THEIR RESPECTIVE EMPLOYEES, AGENTS, THIRD-PARTY CONTENT PROVIDERS OR LICENSORS, OR ANY OF THEIR OFFICERS, DIRECTORS, EMPLOYEES, OR AGENTS, WARRANT THAT USE OF OUR SITE OR SERVICES WILL BE UNINTERRUPTED OR ERROR FREE; NOR DO THEY MAKE ANY WARRANTY AS TO (1) THE RESULTS THAT MAY BE OBTAINED FROM USE OF OUR SITE OR SERVICES OR (2) THE ACCURACY, RELIABILITY, OR CONTENT OF ANY INFORMATION OR SERVICE PROVIDED THROUGH THIS SITE OR OUR DISCUSSION FORUMS. OUR SITE AND SERVICES ARE MADE ACCESSIBLE ON AN "AS IS" AND "AS AVAILABLE" BASIS. WE HEREBY DISCLAIM ANY AND ALL REPRESENTATIONS, WARRANTIES, AND CONDITIONS, WHETHER EXPRESS OR IMPLIED, INCLUDING, BUT NOT LIMITED TO, THOSE OF TITLE NONINFRINGEMENT, MERCHANTABILITY, AND FITNESS FOR A PARTICULAR PURPOSE. IN NO EVENT SHALL WE BE LIABLE FOR ANY INDIRECT, INCIDENTAL, SPECIAL, CONSEQUENTIAL, OR PUNITIVE DAMAGES ARISING OUT OF OR RELATED TO THIS AGREEMENT. WE ASSUME NO LIABILITY OR RESPONSIBILITY FOR ERRORS OR OMISSIONS IN THE CONTENT PROVIDED THROUGH THIS SITE, DISCUSSION FORUMS, AND/OR OTHER SERVICES. THE PARTIES AGREE THAT OUR MAXIMUM FINANCIAL OBLIGATION TO YOU IS THE AMOUNT PAID TO US FOR SERVICES PRIOR TO THE DISPUTE. UNDER NO CIRCUMSTANCES SHALL WE BE LIABLE FOR ANY LOSS OR DAMAGE ALLEGEDLY CAUSED BY YOUR RELIANCE ON ANY INFORMATION PROVIDED ON THIS SITE OR THROUGH OUR SERVICES. YOU ARE RESPONSIBLE FOR EVALUATING THE ACCURACY, APPROPRIATENESS, COMPLETENESS, AND USEFULNESS OF OUR CONTENT BASED ON YOUR SPECIFIC NEEDS. PLEASE SEEK THE ADVICE OF PROFESSIONALS, AS APPROPRIATE, TO EVALUATE AND PROVIDE INDIVIDUALIZED INFORMATION AND INSTRUCTION. ECIR Group, Inc. is an Arizona nonprofit corporation with a principal place of business in Arizona. You can contact Us at ECIR Group Inc.; 2307 South Rural Road, Tempe, AZ 85282, or via email at admin@ecirhorse.org. By using this Site, You agree that any claim, dispute, or controversy You may have against Us arising out of, relating to, or connected in any way with this Agreement, Our Site, or services, shall be resolved exclusively in a court located in Maricopa County, Arizona. Arizona law shall govern all disputes related to this Site and Our services. You agree that You shall only pursue a claim on behalf of Yourself only and shall not seek to file a class action lawsuit. By using this Site or Our discussion forums, You agree to this jurisdiction and venue. In all claims, disputes, and controversies related to this Agreement, Our Site, or services, the non-prevailing party shall be responsible for the prevailing party's attorneys' fees in addition to any damages assessed against them. We reserve the right to suspend or terminate any User's account at any time and for any suspected violation of this Agreement. Termination may occur without advance notification. We shall not be liable for any damages for terminating a User. This Agreement shall constitute the entire agreement between the User and Us with respect to the subject matter in this Agreement. No waiver by either party of any breach or default hereunder is a waiver of any preceding or subsequent breach or default.